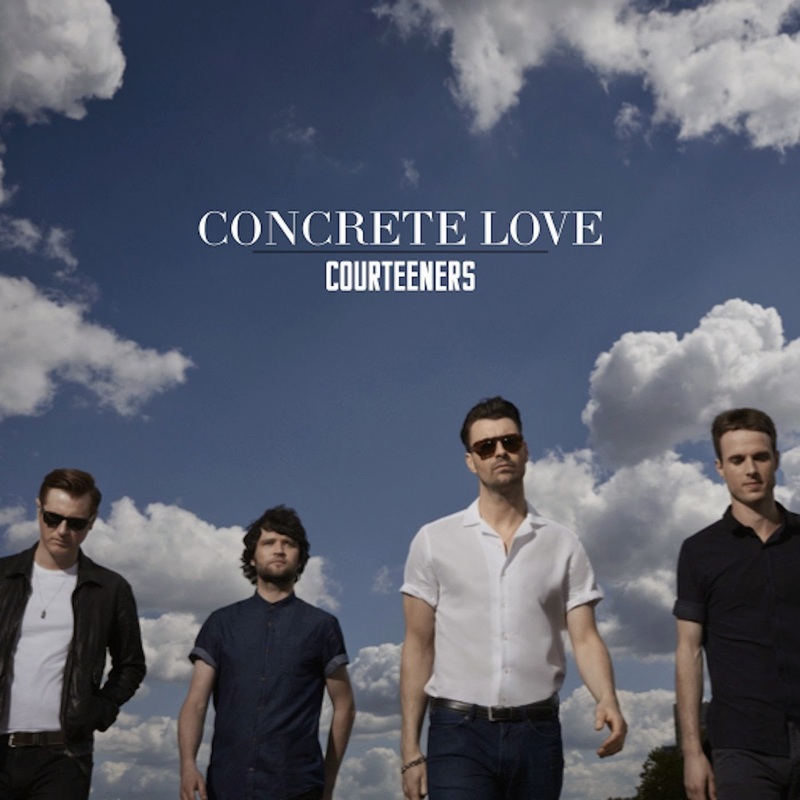 Concrete Love is the Courteeners' fourth album in six years. With no support from radio and very little press from the London-centric media, they've used their Northern roots talk to the disaffected urban youth. This may just be the album to finally crack the whole nation's conscience. Courteeners ("The" seems to now be a thing of the past) have always been the band of the people, particularly in their native Manchester and the North. They came to the fore with simple heartfelt songs that the youth of big cities could relate to and captured a loyal and growing fan base whilst the media sat by and scoffed at their supposed lack of artistry and intellect because they're working class and not from Surbiton with a lawyer Daddy, as if either were a pre-requisite to make great music. Lyrically, the themes and characters that Liam has written about are still there in parts of the album, but are older and at different stages of their lives. There's concern for the hedonistic girl of Cavorting who's now in serious relationship territory being posed the question in Has He Told You He Loves You Yet?, the love expressed in Take Over The World dissipating into the reflection of How Good It Was and refusal to let go of Black And Blue, the indecision of the man in The Good Times Are Calling moving on to chasing the hard-to-get female of Small Bones and Next Time You Call. There's little of the immediacy of those early St Jude singles that brought them to the nation's attention, but whilst some of their fans might be stuck in the "no pyro no party" mentality that their debut inspired, Fray and co have moved on. Six years wiser and assisted no doubt the ability to use better equipment and studios has seen them develop their sound and their approach to a point where there's much more variety and a far richer depth to them on this. And they're a much better band for it. Opener White Horses, pivotal track International and Saboteur move away from their lyrically and aurally direct style to something slightly more obtuse and, whisper it quietly, sophisticated. Gone are the very specific Mancunian references that has possibly limited their appeal outside their home city. In the former Liam talks of "uncontrolled gods in your mind, tugging at your Jekyll and Hyde" whilst the latter opens curiously with "you wanna talk about cocky, it's like Mohammed Ali, tag-teamed with Rocky" and is laden with brass and strings. Saboteur has tinges of glam rock in the synths that underpin the song and guitar solo and they manage to pull it off without it sounding Muse-style contrived. They haven't by any means walked away from producing rabble-rousing tunes though with singalong choruses that will have arenas bouncing along and mouthing every word. First single Summer, Small Bones and Next Time You Call, with its signature opening squal, all boast huge tag lines that will fit in snugly alongside their earlier hits and The International's chorus is made for those mid-set arms round your mate's shoulder pause for breath moments. As the album draws to a close, we get Dreamers, which is possibly the best thing they've ever done. Unusually for them, it's very sparse, a soft shuffling drumbeat and synths. It's a reflection on the state of music - "the charts are full of cartoons and lawyers having a gap year before choosing employers. What about my life? Who is singing about that?" - and a call for dreamers and writers to "come on and unite us." Closing track Beautiful Head rivals it for that crown. It's a heart on the sleeve love song, declaring devotion "it could just be us two and we could make some plans" - you can trace the intent of it back to Take Over The World, but with the joyous abandon and optimism replaced with a more hard-headed rational and practical approach to love. Concrete Love is the sound of a band getting older and wiser. And consequently, it might be the one that delivers them the big breakthrough they've been on the verge of achieving.